The rise of maker spaces and maker-focused events in the United States and around the globe reflects a twenty-first century groundswell of interest in the process of making that crosses all media. Along with making new objects, there is also renewed interest in learning how to mend objects that are in need of repair. Making new things and fixing old ones requires problem-solving skills, technical knowledge, and even the use of highly specialized tools. As makers and menders gather in person and online to share knowledge that would otherwise be lost, they reaffirm values of self-sufficiency, thrift, living sustainably, and reducing waste. 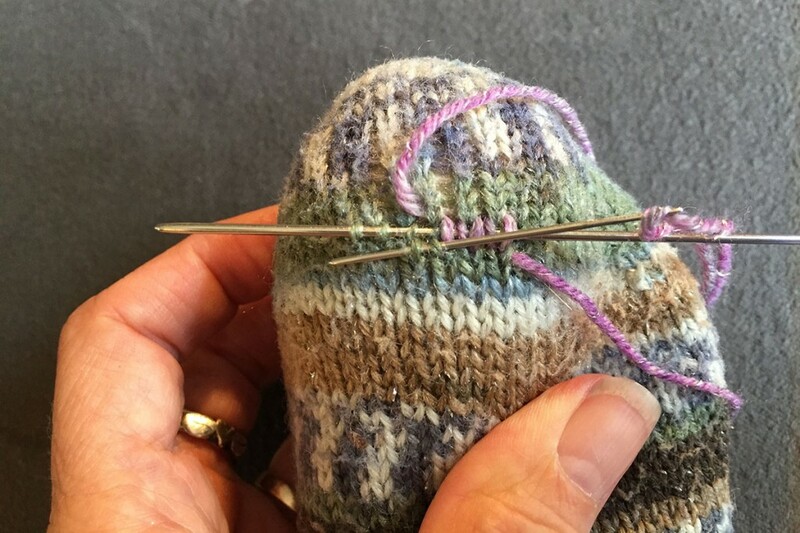 In knitting, a recent zeal for mending has generated instructional videos, articles, blog posts, and social media exchanges on the most effective methods for closing holes and reinforcing weak spots in knitted fabrics. 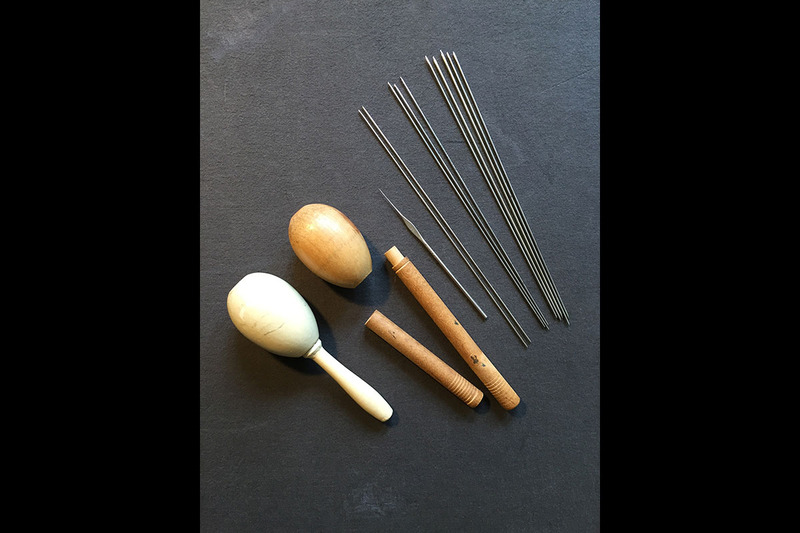 Among the tools now widely available from big online retailers and from individual vendors on Etsy are new versions of the humble, antique darning eggs shown here. Neither of these darning eggs, which I inherited from my grandmother more than twenty years ago, is marked with a maker’s name or date. The smaller one measures approximately 6” long; its quaint, turned handle is permanently affixed to the egg. 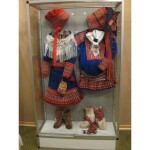 In contrast, the larger one is a multi-purpose, “Swiss Army”-styled, modular darning-tool-and-carry-case all in one. 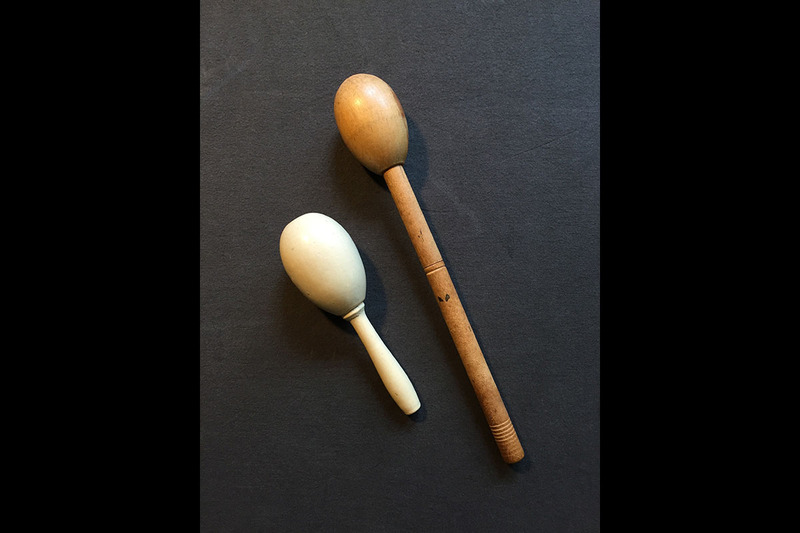 Fully assembled, it measures 11”, but the egg-shaped top can be removed and used alone, or attached to either the top or bottom section of the carry case to make two shorter darning tools measuring 5” and 7”. Perhaps being able to customize the configuration of this darning egg made it easier to repair anything from worn elbows in sweaters to holes in hose. Originally, the pieces probably fitted and held together neatly and securely, but no longer; the wood has expanded and all the joins have loosened over time. 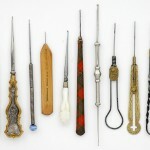 Inside the carry case, I found an assortment of 8.5” unmarked steel sock needles ranging from size 0000 to size 00 – these are very small by today’s standards – and a lone crochet hook marked “Milward 13”. I do not know whether the needles and hook came with the darning egg, or were added later by my grandmother. Until recently, I displayed the darning eggs among my vintage knitting needles; I had never actually used them to darn anything. However, I was encouraged to re-examine my assumption that the time spent repairing hand knitted socks could be better spent knitting new ones when a favorite pair of socks began to look threadbare at the toes, but was otherwise good for a few more years of wear. I have a basket overflowing with new sock yarns to knit, but I know that the average pair of adult-sized socks involves knitting between 20,000 and 30,000 stitches – a substantial project by any measure, even when every stitch is made purely for the pleasure of it. Time spent doing conservation work on hand knits for others has also given me greater appreciation for the economic and social value of my own work as both a maker and a mender, and for the specific, yet different skills each activity requires. 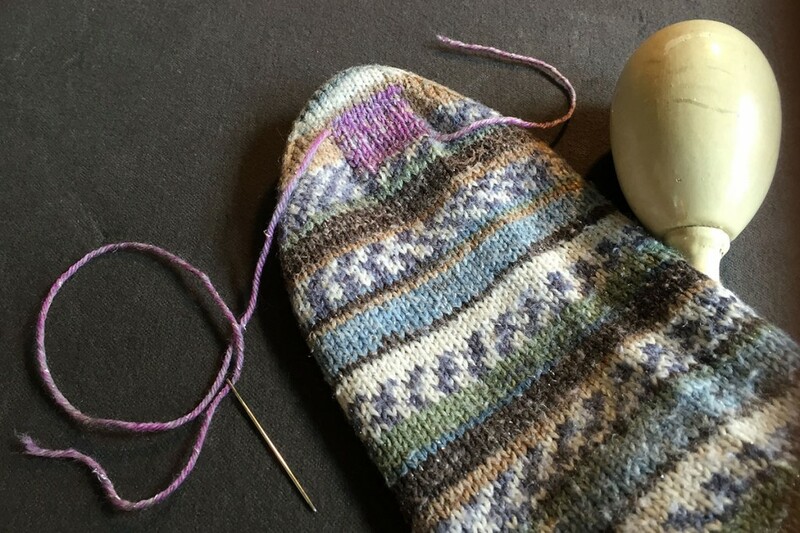 In the images that accompany this post, you can see that once I put the darning egg inside the sock, the support it provided made it easier to see and overstitch the threadbare areas. Before starting to overstitch a row, I also inserted one of the sock needles through the right leg of every stitch in that row for extra stability. I then threaded a tapestry needle with a remnant of contrasting sock yarn, and using the sock needle as a guide, I overstitched the stitches, working from left to right on one row, and from right to left on the next, starting and ending one to two stitches inside the undamaged margin of fabric bordering the threadbare area. After completing each row of repair, I removed the sock needle, and tightened up any loose stitches before moving on to the next row. I was slightly surprised to discover that using the darning eggs in combination with the needle support system, which I had used before, made repairing the damaged socks a very quick undertaking. The repair took me only about twenty minutes, was fun to do, and I saved a pair of socks that took me many hours to knit. I have also used this technique successfully on a sock with a hole, but here it can be helpful to have two needles – one to support the replacement of missing stitches in the row below, until the next row anchors them, and another to support the replacement of missing stitches in the succeeding row, and so on, until the hole has been filled with rows of sound, interconnected stitches. Now that I have successfully used my grandmother’s darning eggs as originally intended, I am very grateful to have these simple, specialized tools on hand.